Well, we finally made it to the Top-10 and it is a Top-10 that looks vastly different than a couple years ago. Of the players written about below, only one was in the Top-10 at the start of the 2017 campaign. 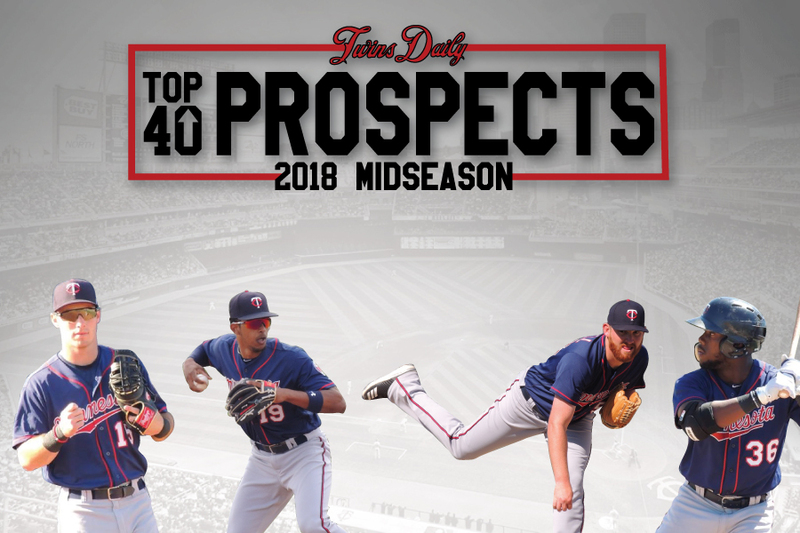 Former high ranking players like Tyler Jay and Kohl Stewart have dropped in the rankings, while other top players have graduated from this list. Many of the players listed below have been acquired during the new front office regime. These are the players who will be most associated with the success or failure of Falvey and Levine. However, only a couple of them project to play at the big league level in 2018 or 2019. It’s going to be a slow process but there are definitely some names to be excited about. Littell joined the Twins as part of the Jamie Garcia trade last July. He made seven starts (41 2/3 IP) in the Twins organization last year and posted a 2.81 ERA and a 1.22 WHIP with a 33 to 18 strikeout to walk ratio. He did this while being over three years younger than the competition in the Southern League. Littell headed back to Chattanooga to start 2018 and didn’t fare as well. He allowed 15 earned runs in five starts (23 IP) as batters hit .308/.364/.495 against him. Things have gone better in Rochester as he has a 2.84 ERA and a 1.21 WHIP in 57 IP. Besides Nick Gordon, he is the youngest member of the Red Wings roster. His big league time has been very limited so there is still plenty that remains to be seen for the 22-year old. Javier injured his shoulder near the end of the 2017 campaign but a regime of rest and rehab was assigned for the off-season. He suffered a setback during spring training and underwent season-ending surgery to repair a torn labrum in his non-throwing shoulder. He won’t step on the field during his age-19 season as he is expected to miss 6-9 months. Last season with the E-Twins, he hit .299/.383/.471 with 18 extra-base hits in 41 games. Baddoo was Minnesota’s second-round pick back in 2016 and he spent his first two professional seasons in the rookie leagues. He’s been an on-base machine as he hit .323/.436/.527 last season between the GCL and the Appy League. Baddoo is getting his first taste of full-season ball this year and his batting average took some hits as he failed to hit over .250 in any of the season’s first three months. However, he has drawn double digit walks in those three months to help him get on base 37% of the time. He can play all three outfield positions but he has played exclusively in center field for most of his professional career. His combination of on-base percentage, power, and speed make him an intriguing prospect to follow. The Twins anticipated Rooker could be a fast mover when they drafted him in the supplemental round of the 2017 MLB Draft. It was the second straight year the team had drafted him (38th round of 2016). He has lived up to that anticipation as he is already playing at Double-A. As a right-handed slugger, Rooker has showed a balanced approach against lefties and righties while posting nearly identical batting averages (one point difference) and on-base percentages (seven point difference). Since the calendar turned to June, he has been killing the baseball. He posted 1.038 OPS with 16 extra-base hits in June. If the Twins continue to be out of contention, Rooker could make his debut as early as this September but a second-half promotion to Rochester seems like a likely first step. Larnach, Minnesota’s 2018 first-round pick, was a hero for the Oregon State Beavers on their way to the College World Series Championship. Larnach and the Beavers survived six elimination games on the way to the CWS title. He also helped the club sign multiple other players since he agreed to a $2.55 million deal which was $570,000 less than MLB’s recommended bonus for the 20th overall pick. Larnach improved in each of his three college seasons and that helped to turn him into a first round selection. His best tool is his bat as he has consistently been able to hit for average. However, this season he has shown the ability to add some pop. He had combined for just three home runs in his first two college seasons before knocking 19 home runs during his junior campaign. His college experience could help move him quickly but his professional debut will start with the E-Twins. I imagine many are going to complain that Littell should be behind Thorpe. Littell's two stints in the majors has probably a bad taste in their mouths... I can't blame them, though, he looked rough. I expect Rooker to finish the season at AAA. I don't think he's quite ready for a MLB call-up in September - I'd rather leave him off the 40 man roster until 2019 and he's in his first full year of minor league baseball (though it should be his only full year of minors if all goes right). I am a big fan of littell.Not sure why he can't get it together in MLB. Here's hoping he can find the pitches he needs to be successful. What would happen if you just kept Larnach at Ft. Myers, have him start at the Gulf Coast League and then jump him to A+ ball, keep tabs on him in the Florida sunshine! It's not like he's a base in the woods and needs to live in Elizabethton or Cedar Rapids for a month or so. He's already got the pitches... He's got good control. He's got the breaking pitches. Not a flame thrower, but he's got enough velocity. He will be just fine. What's the value of that? Would he really get to the big leagues sooner? Are we certain that he'd jump into the Florida State and succeed? While he may be similar to Rooker, he's a year younger and probably isn't quite as advanced offensively as Rooker was a year ago. And, frankly, what's wrong with letting him get his feet wet in E-Town for a couple of weeks with little pressure. Let him adjust to playing every day, or using the wood bat? Or letting him meet other 2018 draft picks in E-Town, after meeting those in the GCL, and then letting him move up to Cedar Rapids and see how that goes. Let him meet those players and those coaches too. He's probably going to start 2019 in Ft. Myers regardless of where he ends this year. Littell's 2018 option was burned when he was optioned in spring training, and he's got two days of service time so far. So, it's not really hurting his "clock" in any way. Littell was the guy on the schedule. He was on the 40-man. He'd been pitching well. He earned the chance. No question, he's got to be better in those situations, and he will be. Part of it is getting through that nervousness and seeing that you can do it. He'll be fine. I was going to write this, so thank you.One correction, I believe, is that a player gets something like a minimum ten days credit each time he is recalled.The PA rightfully wanted to make sure clubs didn't abuse their ability to shuttle players. Like this group.It really hurts when Javier sits out the entire year, especially after missing almost all of his first year back in the DSL.Twins gotta get him out on the diamond next year. Expect there will be lots of comparisons between Larnach and Rooker over the coming years.Really like what Rooker has done at AA so far this year.Will Larnach match his production?Exceed it?Or not? Like many, I question whether Littell is going to make it.But that is somewhat based on his two rocky outings for the Twins.As mentioned above, the circumstances weren't ideal.Maybe he will get a chance in September to settle in and get some innings so everyone can see what he's got. And I was also going to add that the reason Littell's on the 40-man is that it's preferable to losing him via Rule-5. He has enough years as a pro. Once you have your 40-man roster set, that's who you have to work with, during the season when little urgencies arise and callups are needed. That's why Polanco got spotty MLB service for a while. I don't believe they think Littell is quite ready, but he's an arm and sometimes an arm has to be called up for a day. This notion that the front office is mismanaging player options is basically incorrect. Don't understand Larnach over Rooker considering Rooker is already at AA but a nice list nonetheless. I have mostly agreed with your list so far with a minor quibble about Blankenhorn being above Rortvedt Based on their numbers so far plus potential. I did not complain about that but Badoo does not belong in front of many that he is currently in front of based on performance plus potential shown so far and that includes Rortvedt who was promoted off the same team as Badoo earlier this year. Having Gonsalves ahead of Littell who is a year younger, pitched better in AAA, and unlike Gonsalves, made his MLB debut, which means that the Twins prefered him to Gonsalves, makes zero sense. To have him at least 5 spots higher, makes even less sense. Javier and Rooker are underrated. I don't want to be down on Littell, but I was pretty discouraged by his appearances in the majors.It basically tracked with the scouting reports that his minor league results are ahead of his raw stuff, but his fastball control was really lacking and his breaking balls got very few whiffs.The fastball control could be partially written off to nerves.I don't recall seeing the changeup at all, so maybe he deploys it more often to be effective in the minors.But I do wonder about the grades on his breaking balls, MLB hitters seemed to have no problem laying off of them out of the zone and hitting them in the zone. Obviously we can't write him off after two appearances but I'm not sure what to think about him right now. Looking forward to seeing Larnach's debut.If there is just one difference in draft strategy for the new FO it's a much bigger focus on scouting and drafting impact college bats.So far it seems like they've done their diligence.I wonder if there is a more analytic approach to the college guys or if it's just more weight on traditional scouting report for college bats. The reason is that Rooker hasn't been particularly great at AA. Sure, he has been mostly fine, but he is still striking out a lot and isn't going to provide any real defensive value. So everything is tied to his bat. And right now he is performing an order of magnitude worse than a guy like Kyle Schwarber did in his first taste of AA. So given his age, experience, and performance so far, I think Rooker's most likely outcome right now is a below-average but above-replacement-level big league player. Rooker has no defensive position, I think that's part of why he's not higher ranked, like some want. Sometimes it's like defense doesn't matter at all for some people in prospect rankings.....so he's probably in the right spot, if not high, frankly. The way we have handled Littell's call ups reminds me of our how we handle Jorge - who we DFA'd.The call ups and handling made no sense.